Knitting Traditions Spring 2013 brings together knitting traditions from around the world and across time. This issue features 25 knitting patterns with inspiring and informative companion stories that frame the projects in cultural and historical context. Patterns include a vintage pucker-stitch knitted sweater, Orenburg lace scarves, gorgeous gloves and mittens, a miniature silk bag based on one from the 14th century, a sweet sweater and mitts for baby, and more. 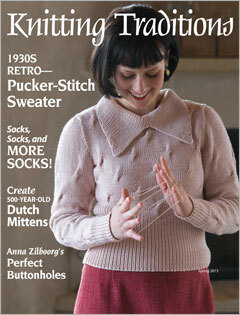 You also find poignant stories about special knitters and a look at knitting schools in Elizabethan England.